On Friday Lisa and I flew to Seoul (we're really not the ballers this makes us out to be. flights were really really cheap) to meet up with Cassidy, a college friend of Lisa's who had flown in for a brief but whirlwind tour of the city. Since we hadn't spent more than a day and a half in Seoul before, we were all set to do the tourist thing together. Lisa and I spent the week looking for cheap and easy accomodation anywhere in the city, which turned out to be much harder than I anticipated. Who knew that Seoul was such a happening place these days? 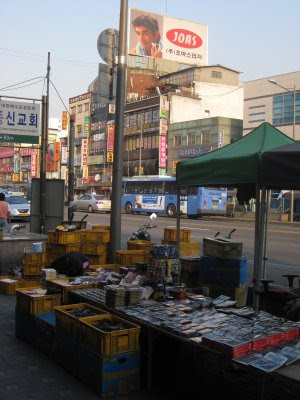 We eventually scored a couple of rooms in Green Park Motel in Dongdaemun (동대문). While Dongdaemun and its spread of clothing markets turned into a pleasant surprise, our rooms were true to the spirit of Korea's love motels - dingy, smoky, and noisy. Luckily we weren't planning on spending a lot of time there. 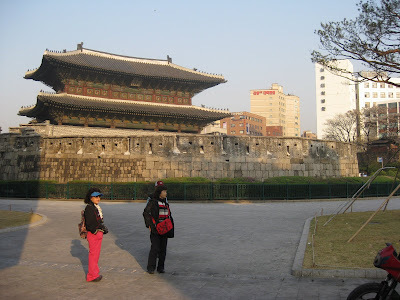 Built in 1397, this is the East gate of the original fortress wall surrounding Seoul. Now just called Dongdaemun gate. John Stamos apparently sells electric razors. It's common to see well-known American celebrities as the face of local or otherwise obscure goods here. It's an easy gig for them, it pays well, and their image doesn't suffer at home - no one who cares ever sees them. Por ejemplo, Paris Hilton is the face of Fila in Korea. 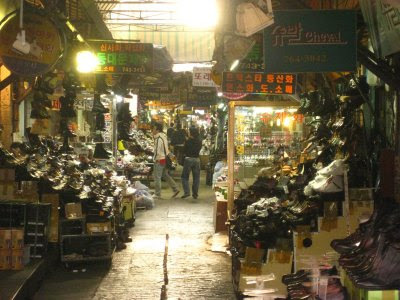 Dongdaemun is home to one of Seoul's largest markets. 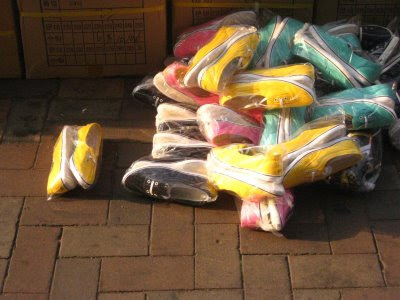 They sell shoes in particular. 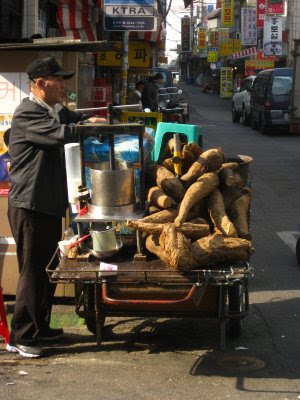 This guy was selling juice extracted from these giant roots. 1500 won/glass. I didn't know what it was at the time, but people passing by on the street would stop and drain a cup or two, so I figured there must be something to it. It was dark as a shot of espresso and tasted quite bitter, but not altogether unpleasant. I later found out it's the root of the kudzu plant, which, if I remember correctly, grows like a weed in the US and is suffocating well-established forests around Virginia. 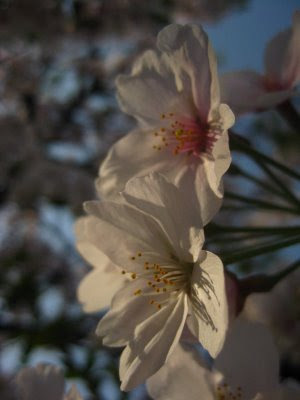 In Pohang, and on the East coast, the cherry blossoms have already fallen. 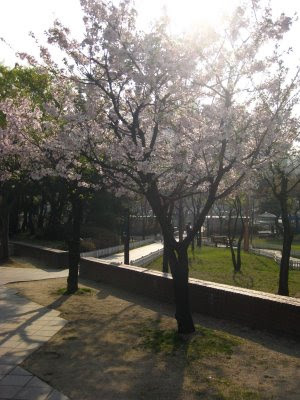 Luckily we caught them at their peak in Seoul's milder climate. But it wasn't all pretty. 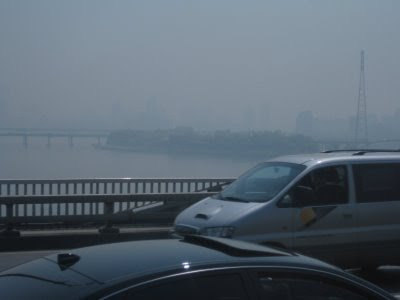 The smog was atrocious, and so thick that visibility was limited to less than a mile. Seoul makes Pohang, with the giant smokestacks of our near and dear steel factory POSCO, look like the garden of Eden. haha who knew it was right in front of me all along.